The newborn screening 0r neonatal screening refers to a preventive pediatric screening service for new-borns to evaluate of access their possibility of genetic disorders in the field of “Inborn Errors of Metabolism”. These types of errors do not harm at the time of birth but have all the potential to cause permanent neurological, cognitive, tactile and physical damage while growing. If inborn errors are screened prior to birth they can be treated easily with the help of sophisticated fully-automated solutions in the highest quality and performance standards, ensuring the highest levels of performance. According to Centers for Disease Control (CDC), over 4 million babies are tested every year for metabolism-related dysfunctions in almost 50 states of the U.S. In the U.S., state-run newborn related programs have improved child healthcare tremendously over the last few decades. The screening methods used in various countries are transient evoked otoacoustic emissions (TEOAE) testing and automated auditory brainstem response (AABR), with distortion product otoacoustic emissions (DPOAE) testing used in detection of newborn hearing screening. Masimo announces CE Mark of Eve newborn screening application for Radical-7, an intuitive software feature to help clinicians more effectively screen for critical congenital heart disease. Labsystems Diagnostics and Baebies join hands to deliver newborn screening solutions globally. To ensure sustainability market players are involved in strategic partnership that is driving the newborn screening equipment market, for instance, Trivitron Healthcare and Agilent Technologies have collaborated in the area of high precision in-vitro diagnostics based on the LC-MS/MS platform. In addition, awareness programs, quality assurance of newborn diagnostic procedure, increasing incidence of newborn diseases, technological advancements, improving infrastructure and healthcare plan, availability of new opportunities for expansion and government initiatives are likely to propel this market. However, lack of trained professionals, lack of healthcare infrastructure, socio economic factors, less priority schemes and health insurance complexity hinders the newborn screening equipment market. The global newborn screening equipment market was valued at an estimated USD 0.45 billion in 2016 and is expected to reach USD 1.0 billion by 2024, growing at a CAGR of 10.5% between 2016 and 2024 owing to government initiatives aimed at enabling the diagnosis of about 29 possible disorders such as phenylketonuria (PKU), galactosemia (GS), congenital hypothyroidism (CH) and hearing disorders in newborns. On the basis of technology, the enzyme assays commanded the largest market share (37.5%) in 2016 followed by immunoassay (30%), while tandem mass spectrometry tends to be the fastest-growing segment in newborn screening equipment market over the forecast years. On the basis of application, Critical Congenital Heart Disease (CCHD) which is screened using the pulse oximeter based technology acquires the major share in newborn screening equipment market. It is estimated that 0.18% infants worldwide, suffer from CCHD, which may lead to death if undetected. 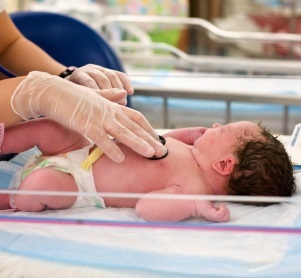 North America newborn screening equipment market has the largest share i.e. 45% while Asia-Pacific is expected to witness lucrative growth over the forecast period. Korea, China, Taiwan, India and Sri Lanka due to the presence of favorable healthcare schemes drafted by government agencies tends to conquer the major market share in newborn screening equipment market.